Oath of the Gatewatch is shaping up to be an exciting set so far. One card that has me eager to brew is Stone Haven Outfitter, and today I’ll dive into its Standard potential. If only development, at the last minute and without testing, had changed the creature boost to +1/-1. Ah, Skullclamp—you’ll forever be ingrained in my mind. As is, Stone Haven Outfitter only provides a +1/+1 bonus, which is a bit out of place on creatures already enlarged by equipment. A 2/2 for 1W is not spectacular either, but the main power of the card lies in its ability to draw cards. What caught my attention in particular is that you can draw cards off of equipped tokens. Grim Haruspex and family usually say “nontoken,” but Stone Haven Outfitter is an exception. As a result, the card reminded me of Fecundity, which once was a key element in combo decks. Although combo decks are a huge part of Modern, I don’t see a great home for Stone Haven Outfitter in Modern. Sure, there is a Puresteel Paladin combo deck that aims to play lots of 0-mana equipment, cast Retract, and eventually win the game with Grapeshot. But no creatures die during this combo turn, so Stone Haven Outfitter won’t add much to this archetype. The Kor Artificer synergizes with Mortarpod, but that seems too slow for Modern. Grafted Wargear or Shuko could work, but you still need a sacrifice outlet and a source of creatures, which is probably too much to ask in Modern. By the way, if you simply attach Grafted Wargear elsewhere, then the original creature won’t be equipped when you have to sacrifice it, which means that Stone Haven Outfitter won’t yield a card. So that doesn’t work as well as you might have hoped. And besides all that, Lightning Bolt’s dominance curbs the prospects of any deck based around a 2-toughness creature. Let’s focus on Standard instead. Slim pickings. Nevertheless, with Relic Seeker to search for the required pieces, I can see plenty of possible directions. Deck lists are often the best ways to convey ideas, so let me just give you a couple. What inspired me to build this deck is the following “dream” sequence. You start with Stone Haven Outfitter and Stormrider Rig on the battlefield. Then, you cast Eyeless Watcher, stack your triggers correctly, and end up with two extra cards, two mana in your pool, and a 2/2 Eyeless Watcher. If you had multiple Stone Haven Outfitters in play, you would have drawn even more cards. And if you had spare mana for equipping, then you could have achieved the same thing with Ghostfire Blade or Stoneforge Masterwork, too. I ultimately increased the numbers on those two equipments because they will be better than Stormrider Rig in games without Stone Haven Outfitters. Stoneforge Masterwork in particular fits with the “tribal” theme of this deck. Besides the Eldrazi Scion generators, green offers plenty other sweet cards. Most notably, it grants Oath of Nissa to dig for Stone Haven Outfitter—I’ll have an article with probability tables for Oath of Nissa and other new cards in two weeks from now—and Tajuru Warcaller. The 3GG card might ultimately be too weak, but it does exploit the fact that Stone Haven Outfitter is an Ally. While this green build is cute, it contains a bunch of cards that are mediocre by themselves—I don’t currently have Call the Scions in my box of “Standard playable” cards—and the payoff for assembling everything isn’t spectacular. So, currently I am skeptical. I was surprised to discover how many playable, cheap legends there were in red and white. 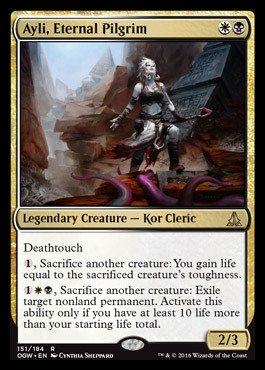 Pia and Kiran Nalaar is an awesome card to return with Alesha, and we even get two aggressive 1-drop legends. Overall, the deck is composed mostly of cards that are fine by themselves, and it can win the game with a mana curve of hard-hitting threats. An early Hero’s Blade is great, but you can win without it. The same thing holds for Stone Haven Outfitter: It can provide a fair board presence and perhaps a card or two, but the deck doesn’t rely on it. In fact, because the deck doesn’t play that many equipment cards and has no sacrifice engine apart from Pia and Kiran Nalaar, I cut the Stone Haven Outfitters down to 2 copies. 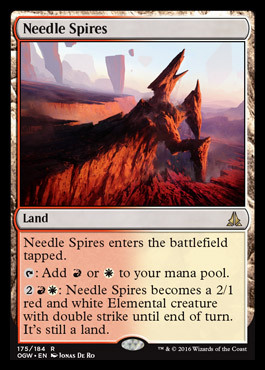 The mana base of the deck is held together by Needle Spires, the new red/white creature-land. Partly due to the now viable mana base, I like the way this red/white deck looks, and I might just dust off those Hero’s Blades. Compared to the Eldrazi Scion deck, this deck needs to assemble more pieces, but it is more powerful when it comes together. The idea is to start with Stone Haven Outfitter, Stormrider Rig, and a Nantuko Husk on the battlefield. (Painful Truths and Relic Seeker can help find them.) Then you cast Secure the Wastes (alternatively, cast Empty the Pits or activate Bloodsoaked Champion multiple times in one turn), stack your triggers, and end up with a hand full of cards and a big Nantuko Husk in play. Ayli, Eternal Pilgrim, the new 2/3 for WB, acts as a fifth sacrifice outlet for this strategy. I’d love to add some extra Ayli along with Seeker of the Way to get up to 30 life quickly, but the equipment theme already makes the 2-drop slot too bloated. To explore the possibilities, I built 3 different equipment decks. I started on a blue variant with Thopter Spy Network too, but that didn’t lead anywhere. Of the decks I built, I like the look of the red/white deck the best, which is weird because it doesn’t even rely on Stone Haven Outfitter. That deck’s competitive Standard prospects remain to be seen, but the selection of red and white legends for Hero’s Blade was surprisingly coherent. The primary issues with the other two decks are threefold. First, there is not enough redundancy—the effect of Stone Haven Outfitter is too unique, and there is nothing in Standard that can replace it in the games where you don’t draw it. Second, the “combo” merely involves drawing a bunch of cards rather than winning the game outright, and I don’t think that is a sufficient payoff. Third, many of the pieces that you have to play are bad without Stone Haven Outfitter, and Stone Haven Outfitter is bad without those pieces. All in all, I see the raw potential, but Stone Haven Outfitter probably needs more good equipment and synergy cards to live up to that potential in Standard. Given that the entire set hasn’t been released yet, I remain hopeful.